Summary: Today is picture perfect, but storms return tonight through Tuesday. The rest of the week appears dry, leading into a stormy weekend. Today, expect a really nice and warm day, with our high temperature reaching 78 degrees under mostly sunny skies. Winds will be out of the south at 5 to 10 mph. Tonight, rain chances increase with a chance of storms. A 20% chance of rain and storms. Otherwise, mostly cloudy with a low around 59 degrees. Showers and storms increase throughout the day from a 30% chance in the morning to around a 70% chance after lunch. Temps will rise into the mid 70’s. The Storm Prediction Center has us outlooked in the MARGINAL category (a 1 on a scale of 0 to 5) for severe weather for Tuesday through Tuesday night. At the surface, a cold front is forecast to advance southward into the Tennessee Valley during the day. Although large-scale ascent should remain weak along the front, the models still agree on convective initiation over Tennessee during the afternoon due to surface heating and enhanced low-level convergence. It appears that a convective cluster will develop over southeast Missouri and move east southeastward into middle Tennessee during the late afternoon reaching the southern Appalachian mountains by early evening. The NAM4 model simulated radar gives us a glimpse into the storms for Tuesday through Tuesday night. The NAM4 shows some rain early in the day, with a period of no rain before the storms come in from Missouri on Tuesday night. We are expecting the bulk of the thunderstorm activity to arrive around 4-6pm and last overnight through daybreak Wednesday morning. 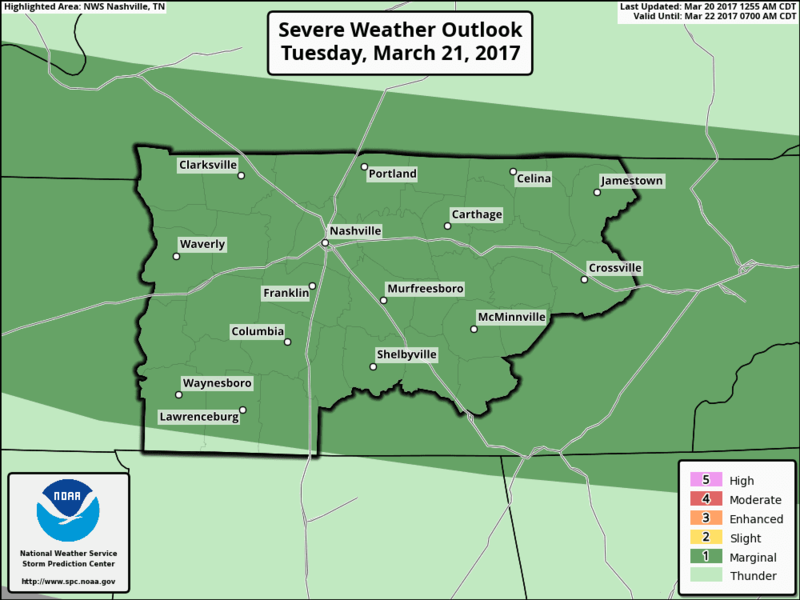 Tuesday night overnight expect a 60% chance of thunderstorms with a low around 45 degrees. Rain and storms to linger Wednesday morning when we get up, but move out during the morning hours. Our high temp will reach about 56 degrees behind the cold front that pushes through late Tuesday. Winds will be out of the northeast at 5pm. Wednesday night gives us mostly cloudy skies with a low around 37 degrees. Winds continue to be out of the northeast at 5mph. Thursday and Friday see temps rebound to the mid to high 60’s under partly sunny skies. Overnight lows dip into the mid 40’s to upper 50’s. Friday will be windy with winds gusting to 20mph. The weekend currently looks wet and stormy, with an 80% chance of rain and storms on Saturday, and a 30% chance of rain and storms Sunday.